As you know parents, carers and professionals may all have different Learning Styles. That’s why all our Sharing Parenting programmes include a successful mix of visual, auditory, reading/writing, and kinaesthetic activities and tools. You will also find these resources below, invaluable to aid your successful delivery and to embed learning. Please see a selection of the magnets below. We have a range of A2 laminated posters, which you can display whilst delivering your Sharing Parenting programmes to aid those visual learners and to recap and embed learning. Our Raising Children booklets and handouts aid learning, and help parents and carers to recap and embed their learning. 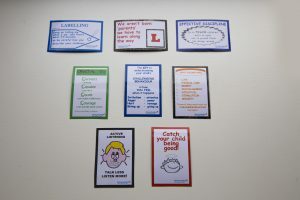 Many of our participants display them on their fridge at home to remind them of the useful strategies they have learnt and as a prompt to continue to practice them. This handcrafted visual aid is extremely useful to demonstrate the hierarchy and what happens if basic needs are not met. To support and embed your learning with any of the above please download the Resource Order Form complete, scan and return by email to info@sharingparenting.com or by post to: Sharing Parenting, 108 Freshfields, Newmarket, Suffolk, CB8 OEF or contact us.